Missouri evening primrose in tallgrass prairie at Camp Cornhusker (Boy Scouts of America) near Humboldt, Nebraska. This photo was taken half an hour after sunset in early June. Light for the image was provided by both the afterglow of sunset and the rising moon. Like other evening primroses, Missouri evening primrose blooms overnight rather than during the day. The plants can produce multiple flowers, which open at about sunset, but each individual flower blooms for only a single night. The pollen grains of evening primroses are attached to each other by very thin elastic threads, which apparently stick very well to sphinx moths, their primary pollinators. Night-flying bees also feed on evening primroses but are not thought to be effective carriers of pollen from one flower to another. A closer view of a Missouri evening primrose plant. 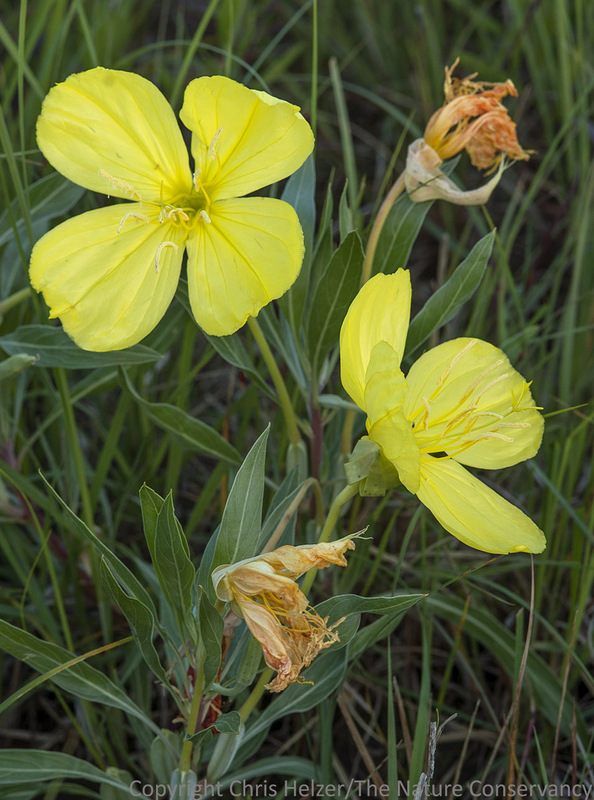 As some of you more botanically-aware readers surely know, the contemporary name for this plant is Oenothera macrocarpa, or bigfruit evening primrose (macro = big, carpa = fruit). Many of us, however, still refer to it as Missouri evening primrose because it used to be Oenothera missouriensis, and I’m choosing not to break that habit. So there. Regardless, it is a beautiful prairie wildflower that typically grows less than a foot tall and has large yellow flowers. Its four-petaled blossoms turn into very distinctive four-winged seed pods, which are often used in floral displays (there happens to be a glass vase full of them on my dining room table right now!) Missouri evening primrose has a long taproot and usually grows best in soils with relatively little organic matter. Most flowers bloom during the day, taking advantage of the numerous pollinators that fly around when the sun is high in the sky. That’s a fine thing to do, but I can appreciate the strategy of evening primroses. Why fight the crowds when you can monopolize the attention of a few specialized pollinators during the off hours? 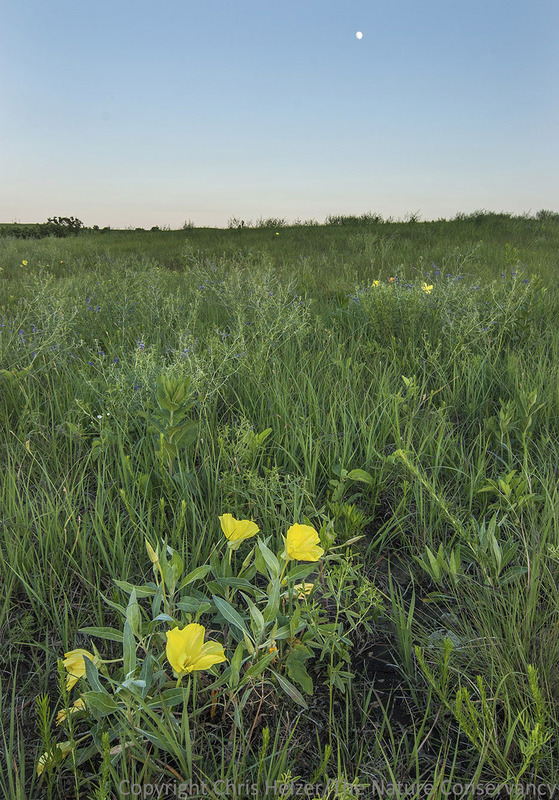 This entry was posted in Prairie Natural History, Prairie Photography, Prairie Plants and tagged bigfruit evening primrose, boy scout camp, camp cornhusker, evening primrose, missouri evening primrose, nature photography, oenothera, oenothera macrocarpa, photo, prairie, tallgrass prairie, wildflower by Chris Helzer. Bookmark the permalink. Thanks for reminding us there are seasons other than winter, Chris. Below zero temps make it seem like spring is only a dream. Here in the UK, we have nothing like your prairies due to the wet climate most of the year. The nearest we have is our largest national park in Yorkshire where to my knowledge their is only one night flowering plant which is the beautiful Night-flowering catchfly. Again, it is looking for the evening moths to do the work of pollination rather than compete for the bees and birds through the day. Thank you for the lesson. What a beautiful prairie flower! Beautiful primrose. Do you also have the showy pink evening primrose (oenothera specisosa) on your prairies up there? Hi Judith, we do have records of it in southeast Nebraska, but I’ve never seen it. Looks like a gorgeous little flower! That’s oenothera speciosa, sorry for the typo. How about a picture of those seed pods to go along with the flower for those of us less botanically knowledgeable? Does the primrose have a strong perfume like most night blooming plants? Karen – my understanding is that the Missouri evening primrose doesn’t have a very strong scent. Not sure about other evening primroses. Anyone who hasn’t yet seen an evening primrose open at dusk is missing a remarkable experience — it’s like watching a time-lapse film, it happens so quickly. Kids are blown away by it, and so am I every time I see it! It’s something to look forward to this summer. Oh yeah, and … Fun to go out to a patch of these at night with a headlamp, and see the eye shine of the big moths that come to pollinate them.